Giannis Antetokounmpo poured in 31 points and pulled down 15 rebounds to lead the Milwaukee Bucks to a 116-106 win over the Dallas Mavericks in a Martin Luther King Jr. matinée. As it turned out, Giannis never got to square off against his brother Kostas after the Mavericks called him up from their G-League affiliate, but perhaps that will come on a different day. The Bucks struggled in the second quarter, both offensively and defensively, but they made up for it in the second half. The Milwaukee Bucks will celebrate Martin Luther King Day with a home matinee against the Dallas Mavericks at Fiserv Forum. The Bucks (33-12) have won four-straight, following a 118-108 win over the Orlando Magic in Orlando on Saturday night. Bucks forward Giannis Antetokounmpo could see his younger brother, Kostas make his NBA debut in Milwaukee. After being drafted with the final pick of the NBA draft last June, Kostas Antetokounmpo signed a two-way contract which allows him to split time between the G-League and the NBA. The Mavericks promoted Kostas from the NBA G-League on Friday, and he will be in an NBA uniform for the first time on Monday. Kostas Antetokounmpo played high school ball at Dominican High School in Whitefish Bay, before a college career at the University of Dayton. 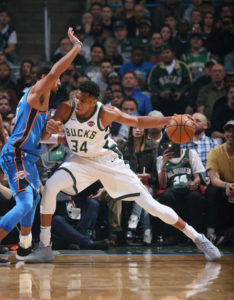 The Milwaukee Bucks extended their win streak to two games, coming from behind to beat the Dallas Mavericks 109-102 on Friday night at the BMO Harris Bradley Center. 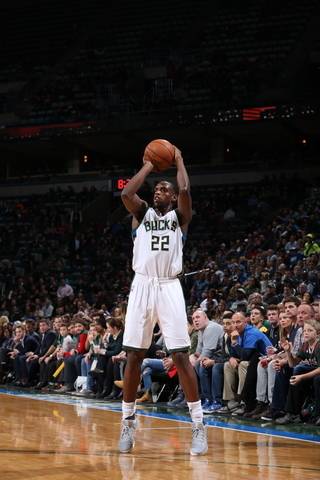 Khris Middleton poured in a game high 31 points, 16 of which came in the fourth quarter. Giannis Antetokounmpo added 27 points and 11 rebounds and Eric Bledsoe had 24 points, including 12 in the fourth quarter. Malcolm Brogdon played 40 minutes and finished with 14 points and a team-high six assists. Brogdon’s minutes were up with Tony Snell out of the lineup due to left patellar tendinitis. The Bucks didn’t take the lead until late in the third quarter and were able to maintain it down the stretch. The Bucks wrap up their three-game home stand by hosting the Utah Jazz on Saturday night. The Jazz had won six straight before back to back losses to Oklahoma City and Houston. Their 6-game win streak included a 121-108 win over the Bucks in Salt Lake City, when they made a franchise-record 18 three-pointers. The Milwaukee Bucks let a 13-point lead in the fourth quarter get away, falling to the Dallas Mavericks 106-104 in their preseason opener. Dallas rookie Johnathan Motley scored the game winning basket for the Mavericks with 4.7 seconds left. 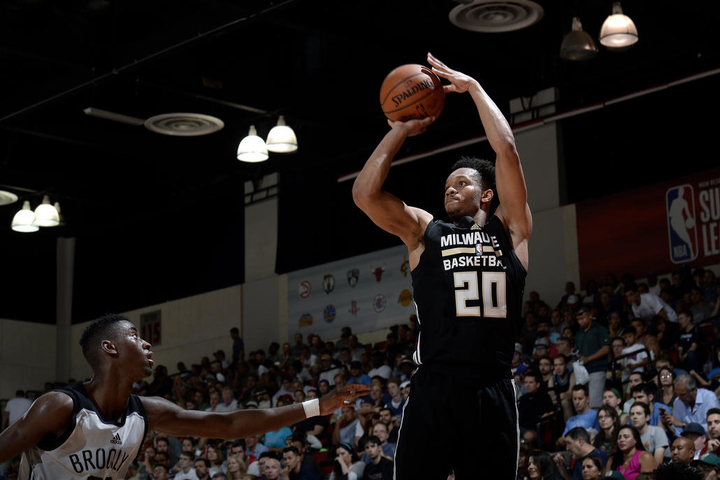 Rashad Vaughn’s three point attempt at the buzzer was off the mark. Vaughn led the Bucks with 20 points on 8-of-18 shooting. 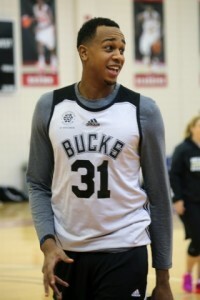 Bucks first round draft pick D.J. Wilson finished with 9 points on 4-of-7 shooting in his debut. Fellow rookie Sterling Brown was 0-for-9 from the field in a team-high 27 1/2 minutes. Kendall Marshall tallied 10 of the Bucks 34 assists in 16 minutes, all in the second half. Greg Monroe had 12 points and seven rebounds. The Bucks played without their star, Giannis Antetokounmpo, who didn’t make the trip following the death of his father over the weekend. Bucks coach Jason Kidd said there’s no timetable for Giannis’ return. Second-year center Thon Maker also missed the exhibition opener due to a right ankle injury that he suffered in practice. The Bucks return to action Wednesday night when they play host to the Indiana Pacers at the BMO Harris Bradley Center. The Milwaukee Bucks had a tough night offensively but still had a chance to keep the Dallas Mavericks winless. Then came overtime, where the Bucks managed to score just one point and commit five turnovers on the way to a 86-75 loss. Harrison Barnes led the Mavericks (1-5) with a career high 34 points on 13-of-26 shooting. Point guard J.J. Barea added 21 points. Bucks leading scorer Giannis Antetokounmpo got into early foul trouble and they struggled without him. Both teams struggled offensively. The Bucks hit 30 of 82 from the field (36.6%) and Dallas hit just 33 of 88 (37.5%). 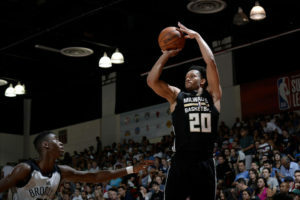 The Milwaukee Bucks needed a late defensive stop against Dallas on Friday night and they got it, pulling out a 96-95 win over the Mavericks at the BMO Harris Bradley Center. The Bucks (15-23) build a 17-point first half lead, then fought off a furious Dallas rally in the second half. The Mavericks (21-16) fired 26 three-point attempts in the first half and made just six. they finished 14 for 44 (31.8%) from beyond the arc for the game.